Greetings, loyal citizens of Waukegan Sector. In these dark times when our underground complex is increasingly under siege by angry mutants, no weapon is more fearsome than the accordion. 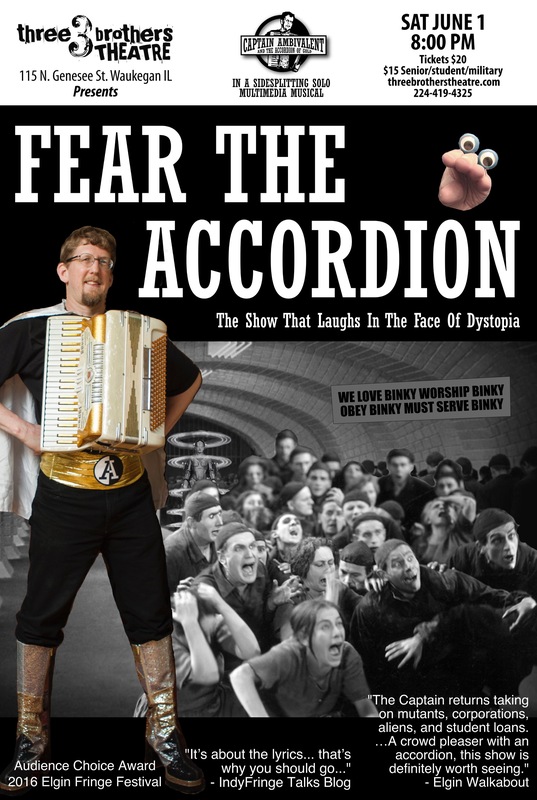 And no one wields an accordion more fearsomely than Captain Ambivalent. His not-so-secret identity Dan Biemer spent years in the corporate world as a litigation paralegal and electronic discovery expert, paying off student debt and struggling to find time for music and laundry, before taking the logical step of past privileged white males in quitting to become a superhero. Prior to falling asleep back in 2016 and suddenly waking up in our era, Captain Ambivalent was an internationally obscure satirical songwriter based in Chicago/ Northwest Indiana Sector, battling market forces through partnerships with coffee houses, art galleries, alternative theaters, Fringe Festivals, PierogiFest, GenCon, even a brief uncredited cameo on America’s Got Talent. He performed “Pirate Ninja Zombie: The Not So Secret Origin of Captain Ambivalent” at Three Brothers in 2014 and 2015.
defied traditional music genres and he took pride in bringing laughter to weirdos of all demographics. The Captain was blissfully unaware that hordes of mutants from the deadly wasteland outside our armor-plated walls were slipping through the airlocks and infiltrating every level of society. In his search to understand how we got to this point, he looked to film classics like Metropolis and Star Wars, 1980s fear culture, and a role playing game called “Paranoia,” and discovered he may have unintentionally had a little hand in The Complex himself. The Computer has now ordered him to explain everything in song to you, the heroic survivors of the amnesia gas incident on level 12. In order to serve you better, Captain Ambivalent will be assisted and closely monitored for treason and quality assurance by The Computer’s avatar Binky until such time as he can be replaced by a robot. The Captain will also provide supplemental security for your sector, maintaining a highly visible presence while deploying a state of the art Mutant Detector designed by The Computer for flawless operation and accuracy until such time as he can be replaced by a robot. Any suggestion that this is all some complex metaphor for internet polarization would be treason. Binky and relevant slides, videos, and backing tracks will appear through an innovative self-contained mobile compact audiovisual station built from a repurposed hand cart. No Waukegan Sector resources but electricity will be diverted. Experience the artist one audience member described as “like a twelve year old on speed, but in a good way.” Dystopia has never been so much fun.